It’s an awkward conversation. The questioner either then can’t look you in the face or shuffles off in a different direction, mumbling sorrys and oh my gods as they go. Let’s put an end to this. On the ‘cba’ days here’s a list of ‘no make-up’make-up products I like to use and avoid awkwardness. It’s all about the glow from within they say. But when you ain’t got two glows to rub together, you need them to come out of a tube. Forget powders and brushes, this is all about the creams and those amazing tools called…your fingers. Oh and a beauty blender. Because where would we be without those beauties? 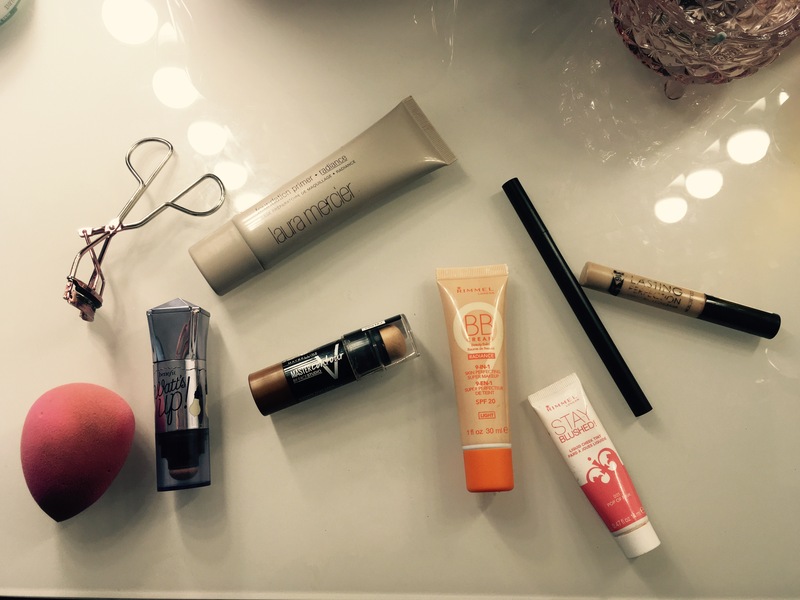 No.2 – Concealer. For those tired little sleeping bags under your eyes. Or those dark circles because of all the times you go to bed tired but end up sitting their wide awake for 4 hours and stalking your best friend’s ex’s mother’s cat on Instagram. We’ve all done it. One of my all time favourite concealer’s is the Collection (2000) Lasting Perfection Concealer in Warm Medium. Its creamy and great coverage without breaking the bank. Literally. Like its under a fiver. And it’s so so good ! Blend it in with the pointed tip of a damp beauty blender to get those nooks and crannies and you’ll look brand new. No.5 – CONTOUR. I’m sorry, I know this is a no make up make up look but there are no rules to say you can’t have ‘natural’ chiselled cheekbones and face (some of us aren’t born with amazing bone structure unfortunately.) So I always contour. Wherever I’m going. Whether it be muted or out there. It’s there. On my face. And for days like this I choose a cream contour. And the Maybelline V Shape Duo Contour Stick in Medium has literally been one of the greatest things to ever enter my life. (Makeup wise….honest.) Its so handy because it’s a 2 in 1. Hence the word Duo. Funny really. I just swipe on the contour from one side then with the twist of my wrist on goes the lighter shade contour wherever you fancy it. It’s not an extreme contour and that’s what I like. And that’s all I do – swipe it on and then blend with a damp beauty blender! Good to go. No.6 – Eyebrows. No matter what day it is, or how you’re feeling you must repeat to yourself ‘eyebrows are paramount.’ It’ll sink in eventually. They frame the face, and that’s a pretty important job if you ask me so give them the TLC they deserve. Not going to lie, I’ve been blessed with quite thick and dark eyebrows but they can always be improved. And so I recently purchased the Sleek MakeUp Eyebrows Stylist in Dark. Its an angled pencil on one end and a brush to buff it all into place on the other. It’s another 2 in 1 so it’s less the hassle and what’s not to love about that. It gives my brows a natural defined shape and fills in all the little gaps. And natural’s what we’re going for. Two thumbs up. No.7 – Highlighter. Now you may think I’m turning this into a Saturday night make-up post and I’ll be talking about how to create the best smokey eye next but fear not. Highlighter to me is essential because it takes on the job of making my face look hydrated and alive even when it’s not. The primer and everything else can only take you so far. Just a little cream highlighter from the ends of your eyebrows in a ‘C’ shape down the top of your cheekbone is just the right amount for the perfect’ no make up makeup look’ in my opinion. Even more perfect when your face catches the light and your face wows everyone and your boyfriend comments on how good it looks. I always use Benefit’s Watts Up Highlighter Stick. It starts off as a cream consistency in the tube so its easily applied and blended. Once again, I love to use a damp beauty blender just to buff it into my skin. No.8 – I finish off this make-up routine with a little bit of cream blush. I reach for the Rimmel ‘Stay Blushed!’ in the colour Pop of Pink. Its a lightweight liquid cheek tint and it’s a great way to give your cheeks a flush of colour without weighing them down with powders. I just squeeze a little onto my finger and the dab it onto both apples of my cheeks and then do the rest of the blending with a damp beauty blender (broken record.) You’ll look like you’ve just been for a brisk walk without the sweating. And that’s it. 8 simple products I use which can be interchanged with any of your preferred products which do a similar job. Let me know what you think and if you recommend any other products. I really would love to hear from you!